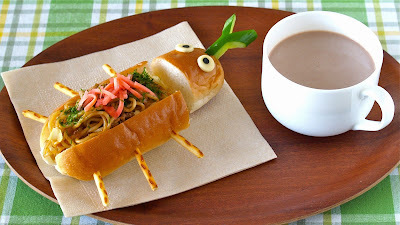 Obviously the recipe is very simple, so I will show you a cute way of making it! Perfect snack idea for kids!!! 1. Cut off one side of the hot dog bun to make the face. 2. Split the top of the bun for the body with a knife, put some mayonnaise, place Yakisoba, and top with Aonori and Beni Shoga if you like. Insert Pretz to make the legs. 3. Make eyes with sliced cheese and Nori, cut and insert cucumber to make the horns. 4. Serve on a dish.